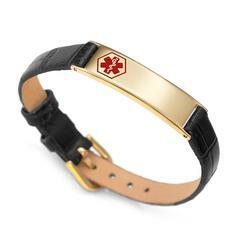 Medical id alert Watch Style black leather and gold plated stainless steel medical id bracelet is adjustable to fit wrists from 5 1/2 to 7 inches.perfect classy medical bracelet. Great for men, women, tenn boys and girls! Leather has a texture similar to crocodile skin.